"Experience the taste of tiramisu in a spectacular, creamy cheesecake. Mamma mia!" Line 13x9-inch pan with foil, with ends of foil extending over sides. Spread half the wafers onto bottom of pan. Add 2 tsp. coffee granules to 2 Tbsp. hot water; stir until dissolved. Brush half onto wafers in pan; reserve remaining dissolved coffee for later use. Beat cream cheese and sugar in large bowl with mixer until well blended. Add sour cream; mix well. Add eggs, 1 at a time, mixing on low speed after each just until blended. Remove 3-1/2 cups batter; place in medium bowl. Dissolve remaining coffee granules in remaining hot water. Stir into removed batter; pour over wafers in pan. Top with remaining wafers; brush with remaining dissolved coffee. Cover with remaining plain batter. Bake 45 min. or until centre is almost set. Cool. Refrigerate 3 hours. Use foil handles to lift cheesecake from pan. Top with Cool Whip and cocoa powder just before serving. Prepare and bake cheesecake as directed, substituting a 9-inch springform pan for the 13x9-inch pan and increasing the baking time to 1 hour or until centre of cheesecake is almost set. Run knife around rim of pan to loosen cake; cool before removing rim. Refrigerate 4 hours. Top with Cool Whip and cocoa powder just before serving. i love and use this recipe all the time. It is so easy and delicious. If you don't have instant coffee you can just use strong regular coffee. This is my go to dessert recipe! Sooo good!! People always ask that I make it and I never have leftovers. I sprinkle chocolate shavings on the top with the cocoa powder to dress it up a bit. This is so good! I made it for my grandparents 60th anniversary party and it was a major hit! The only thing I changed was adding twice the amount of instant coffee. My sister-in-law made exactly the same one. It was delicious. 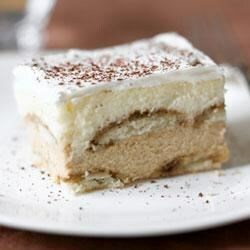 I'm going to make this tiramisu cheesecake for Christmas! I bet its gonna be D.E.L.I.C.I.O.U.S. !